PLUS additional Free tubes or Rebate coupons. 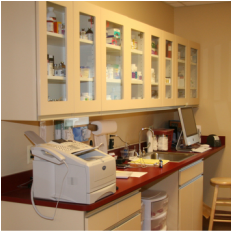 CONVENIENCE: Pick-up medication immediately at time of appointment or call us for rapid refills. EXPERTISE: Get answers from the veterinarians who know you and your pet. We can answer your questions about administration, side-effects, other available formulations, and much more! If you are not satisfied with any unopened, prepackaged prescription item that we dispensed within 30 days of purchase, return it for credit on your pet's account. Certain products or medications may be returned for credit, even if opened or used! CONVENIENCE: FREE delivery to your home! CONNECTIVITY: Barnside Veterinarians have a direct electronic prescription-writing connection to these pharmacies. With VetSource and Vets First Choice, we prescribe-they provide. AVAILABILITY: All the top products and brands you know and love! PLUS: A broad spectrum of less-commonly prescribed medications, dosages, formulations including individualized compounded medications specifically for your pet. FOODS: Science Diet, Purina, Blue, Royal Canin, The Honest Kitchen. Whether you're looking for a breed-specific diet, human-grade ingredients, grain-free or a prescription food for your pet's health condition, you can get it here. TRUST: VIPPS and PCAB certified. These two online pharmacies work directly and legally with pharmaceutical manufacturers. It's still your pet and your pet's medication. You are welcome to pick-up a written prescription to take or mail wherever you choose. 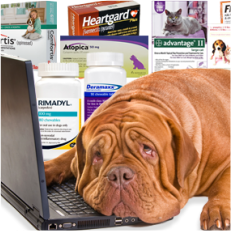 Due to concerns about product stability and changes to your pet's needs, we generally will not write a prescription for more than 6-month's worth of medication at a time. As of 2017, we no longer approve faxed or telephone prescriptions from outside pharmacies. These are medical, veterinary products and should not be purchased through some "warehouse." Pharmaceutical manufacturers will only guarantee their products if they are purchased through a veterinary hospital. Unfortunately, we have seen a significant increase in errors (wrong product, wrong dose, wrong directions) from many online and even local pharmacies. There has also been an increase in communication difficulties with trying to prevent or correct these mistakes. Online resellers often obtain these products illegally through "gray markets" and foreign countries. "We currently purchase a portion of our prescription and non-prescription medications from third party distributors and we are not an authorized distributer of these products. We do not have any guaranteed supply of medications at any pre-established prices."